Go to XKCD to read the bonus hover text! Crystal energy would allow New Mexico to power the world. Crazy phenomena: hats. If it worked companies would be making a killing in: keeping aliens out of our thoughts. Are they? Well, I have a number of hats and never leave the house bareheaded and no aliens appear to be invading my thoughts. I’m not sure how much of a killing companies are making, though. Challenge Yourself – Be an Army Magician- Go Army! Curses and Hexes serve a vital role in supporting the Army mission. They provide the supernatural capability not readily available in the “muggle” military. The Army integrates the talents and skills of its military and sorcerous members to form a Total Army. This is an Occupational Band 02 job in DCIPS. Band 02 duties are at the Full Performance work level, and equal to those at GS/GG 7/8/9/10. Salary will be set within the band equal to a GS/GG grade based on the selectee’s quals in relation to the job. 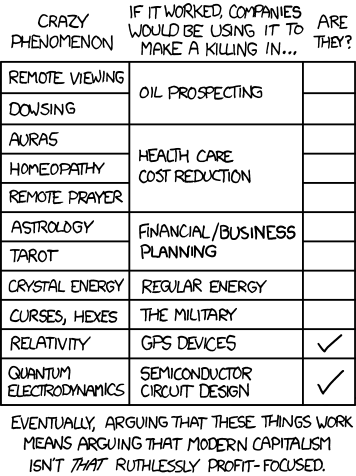 Am I the only skeptic in the world who hates XKCD? @boxbrown Whoa, fancy seeing you here, I think your comics are spectacular. I love that you read Skepchick too. It’s sad though that if he’d left out the “to make a killing”, there’d be a lot more ticks. Thanks, J for J, I love the Skepchicks! @boxbrown: Hey wow, love it! enjoyed your table. food for thought on presentation.